off the favored Las Vegas Wranglers in six games. After coming up short in his first six professional seasons, one of the ECHL's top defensive defensemen fulfilled a dream last week when the Cincinnati Cyclones defeated the Las Vegas Wranglers in six games to win the Kelly Cup. "I think it's sunk in … it's been a long week," Starling told NHL.com. "The first two days felt like it was four or five days. We had a lot of stuff to do and we've been pretty busy going around with the Cup. We're just enjoying the city." The city rallied around the first team to deliver it a championship since the Cincinnati Reds swept the Oakland Athletics in the 1990 World Series. Gradually, the Cyclones' attendance rose through the regular season and the playoffs. 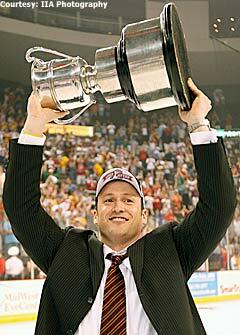 By the time Starling hoisted the Kelly Cup last week, the Cyclones had made ECHL history. Their series-clinching win over Las Vegas at U.S. Bank Arena was witnessed by a standing-room-only crowd of 12,056 -- an ECHL postseason record. "It became very huge within this city," Cyclones coach Chuck Weber said. "It was unbelievable, just the way they responded from the media. We had every station down. I was running press conferences and we actually had people showing up for these press conferences. Last year we really didn't get much media attention until the division finals. This time it really started at the start of the playoffs. Putting hockey back on the map in this town has been really special." It certainly was a special year for Starling. Not only did he win his first professional championship, but his remarkable plus-48 rating during the regular season was tops in the ECHL. Starling also was a plus-10 during the Kelly Cup Playoffs. While some may not put much stock into the plus-minus category, Starling takes pride in his ability to keep the opposition from celebrating in front of him. As a team, Cincinnati allowed just 178 goals, second to only the Texas Wildcatters (177) for the fewest in the league. "It's my bread and butter," said Starling, who had two goals and 20 assists in 63 games during the regular season. "I'm not really a goal scorer. I take more pride in my defensive part of the game than the offensive part. It's my job to shut the other team down. I didn't think it'd get that high, but you just kind of take it one game at a time. … We had good goaltending all year, and that helped a lot, too." As did Starling's leadership -- on and off the ice. With as many as a dozen rookies in their lineup over the course of the season, the veteran Starling took it upon himself to help Weber and assistant coach Dean Stork show the first-year players the ins and outs of professional hockey. On top of that, Starling also played through tremendous amounts of pain. With his team often depleted by call-ups and injuries during the regular season, Starling managed to fight through his own aches and pains to help the Cyclones win games. At one point, he found himself skating alongside forwards on the blue line due to Cincinnati's shortage of defensemen. "It was huge," Weber said of Starling. "The leadership that he brought through his hard work, his willingness to play hurt … that was key. I was really happy for him to be able to be the first one to hoist the trophy, because that's the first championship that he's won in his career. It's funny -- at 27, he's the old man on our team. "He was the true warrior for us all season. He played hurt most of the year. People don't realize that he was playing with some very significant injuries probably since January. He probably practiced maybe a handful of days between January and April." Even as far back as training camp, Starling and Weber at least had an inclination they could be on the verge of something special. After losing just 12 games during the regular season (55-12-5), the Cyclones marched into the Kelly Cup Playoffs. They swept the Johnstown Chiefs in the North Division Semifinals, and then fought off elimination in topping the Reading Royals in the division finals in seven games. They then got past the South Carolina Stingrays in five games in the American Conference Finals to reach the Kelly Cup Final. "That series really battle-tested us," Weber said of the Reading series. "Johnstown was a physical, hard-nosed team to play against, but we were more talented than Johnstown was. But Reading really took it to us. We had to be at our very best every night. If we didn't have that series, we wouldn't have been ready for South Carolina and we definitely wouldn't have been ready for Vegas." "I think Reading was probably the toughest team we played all year," the defenseman said. "They played us tough and they've got a good coach over there. They shut our power play down for the most part." But Cincinnati has a pretty good coach, too. While Weber already has begun the recruiting process for what would be his third season with the Cyclones, he told NHL.com he's not ready to rule out a chance to coach in the American Hockey League. Whether or not he'll get such an opportunity should be determined in the next few weeks. "If I'm in the ECHL, I'll definitely be in Cincinnati," Weber said. "There's going to be a lot that's probably going to shake out in the next couple of weeks in the American Hockey League. I'd love to have the opportunity to talk to some people. But I've already started working on players for next year in the last two or three days." If Weber doesn't get his shot in the AHL next season, Starling is convinced it's only a matter of time before his coach moves one step closer to the National Hockey League. "He worked his way up," Starling said. "I had him as an assistant in Utah, and that's why I came over here. Just the way he carries himself … everybody respects him a lot. He doesn't command respect, he earns it. Players appreciate that. He's a good teacher. I don't think he'll be here much longer." It certainly won't be as long as the wait Starling had to endure in order to win his first championship. "It's been a long time … seven years," Starling said. "Pretty unbelievable."